The first new Catechism of the Catholic Church in more than 400 years, this completely updated Catechism is a complete summary of what Catholics throughout the world believe in common. The full, complete exposition of Catholic doctrine, this second edition of the international bestseller has been significantly expanded, enhancing both its content and usability. 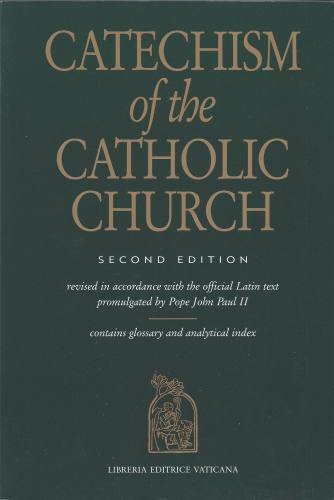 Revised in accordance with the official Latin text promulgated by Pope John Paul II in 1997, the second edition now includes more than a hundred additional pages, offering such new features as a glossary of terms, an index of citations from sources and in-brief texts on core teachings. The essential elements of faith are presented in the most understandable manner, enabling everyone to read and know what the Church professes, celebrates, lives, and prays in her daily life.The second edition includes a new index. The glossary was also added in the American version of the second edition of the Catechism of the Catholic Church. This paperback edition is perfect for classroom and parish use, as well as personal study.